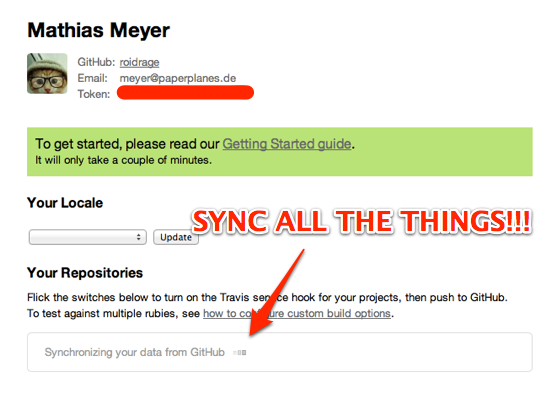 Until recently, we only synchronized your GitHub repositories once, when you first created your account on Travis. That had the downside that when you created new repositories they wouldn’t automatically show up, and you had to set up the build hook manually. We also didn’t show you the organization repositories you have access to. 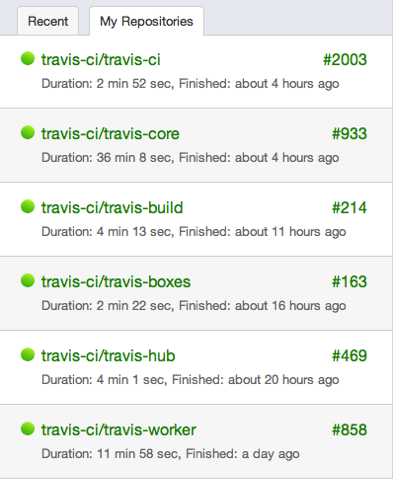 So again, there had to be a manual set up process to get the project running on Travis. Also, in the rare case that you renamed your GitHub account (just as I did recently) we wouldn’t pick up that change. Thankfully, all this is now in the past, and as of recently, we introduced a synchronizing step in Travis that allows you to keep your profile and list of repositories up to date. When you log in for the first time we trigger a background task that checks with GitHub and fetches all the repositories you have administrative access to. Why only administrative? Only administrators of a repository are allowed to configure the service hook required for Travis. So when you log in and go to your profile page for the first time, you’ll be greeted with this screen. To show you how serious this synchronizing process is, notice the progress indicator. You can leave the page open until the process is finish, your repositories will automatically show up once it’s done. 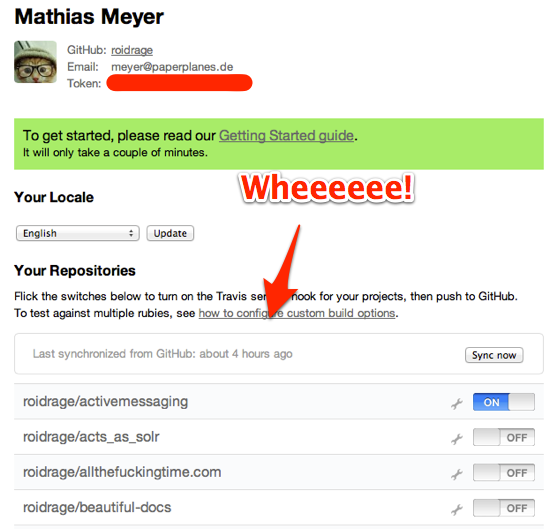 You can trigger a sync when you added a new repository. We also trigger one every time you log in, to make sure we’re already up-to-date should you want to set up a new repository right away. Until now, the “My Repositories” tab used to be a pretty lonely place. It only showed your personal repositories Travis knows about, not the ones of your organizations. To make it a merrier place for everyone it now shows all the repositories that we synced for you, so all repositories you have access to now show up in that tab, nicely sorted by the most recent build, including all the repositories of organizations you’re a member of. That way, when a new user signs up and his or her organization is already using Travis, he or she will have immediate access to the respective repositories. This is much less confusing for everyone using Travis. There is still a tiny bug in our synchronization which we’re currently working on. Currently you’ll only see repositories you have administrative rights too, basically the same as in your profile page. We’re improving the synchronization to respect push access too, so that you’ll see all repositories you have push access too as well. All this is relevant to Travis Pro as well, to go full circle on this. A user that has administrator access to repos of several organizations on GitHub should be able to have access to all of them on Travis as well. This change benefits both platforms as it’s now much much easier to set up Travis CI for public and private repositories as needed.